One of the most impressive and incredible off roader in the Indian car market is Tata Xenon XT. This massive vehicle is available in two trims, one of which is a Tata Xenon XT EX 4X2 , while the other one is an all wheel drive variant. This formidable off roader has some of the most striking features and a very strong and sturdy body structure, which can take on any terrain effortlessly. This off roader is well styled and has clean lines all over, which gives it a chiseled and refined look. This vehicle is mainly for those people, who like to go for adventurous drives in to the jungles, off roading into the valleys and other such landscape’s. This is one off roader that can be customized in many different ways as per the whims and fancies of its owner’s such as a front guard can be added for added protection of the massive engine as well as the frontage, then the roof lights can be added for enhanced visibility in any weather and terrain conditions in the dark, heavy rainfall, mist and fog or any other such adverse weather conditions as well. The front of this Tata Xenon XT 4x2 has a stylishly designed radiator grille, which is quite large with black colored horizontal slats. This grille also has the big crest of the company embossed on it, which has a glossy chrome finish.This off roader can be added with a side step that gives additional comfort to the passengers, while a canopy can be added as well along with stylish roof rails as well as a roof carrier as well. 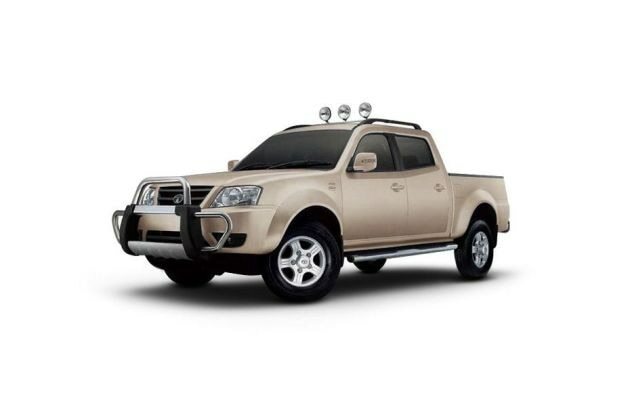 Apart from all these, this Tata Xenon XT has some other charming and robust features as well with a bold and aggressive front bumper that has an air dam, which gives this off roader a very masculine and macho appeal. The company is offering Tata Xenon XT 4x2 in quite a few lively and refreshing exterior paint options, which will certainly entice the customers. These color options comprise of four vibrant exterior paints, which are a pure and divine looking arctic white and then there is this elegant and aristocratic quartz black along with a flamboyant mineral red and a subtle yet charming arctic silver metallic finish as well. The overall measurements of this colossal off roader, Tata Xenon XT 4x2 are very spacious and the users can do a lot of personalization of this vehicle. The total length of this huge off roader is 5125mm along with an overall width of 1860mm, which includes the external rear view mirrors as well. The total height of Tata Xenon XT 4x2 is about 1833mm and it has a gigantic wheel base of 3150mm along with a remarkable ground clearance of 200mm. The minimum turning radius of this muscular off roader is about 6 meters and this powerfully built vehicle has a kerb weight between 1900 – 1990 kgs with a load carrying capacity of close to 220 kgs. The Tata Xenon XT 4x2 can comfortably accommodate five passengers in it and has a big fuel tank, which can store close to 65 litres of fuel. The interiors have been done up tastefully and have a luxuriant feel to it. The seating arrangement is very comfortable and the seats are covered with plush and high quality upholstery, which makes the drive very comfortable. The seating position is quite high and is very comfy, which offers a very good visibility all around. The driver seat can be adjustable and has an amazing back and thigh hold up with impressive lumbar support, which makes even the longer drives extremely congenial. The interiors are done up in an attractive two tone beige combination with smooth and very neatly done up internal surfaces. The seats also get the dual tone treatment and are covered with plush fabric upholstery, which add to the up market look of this vehicle. The central console is brilliant and very stylish with a graceful faux wood finish along with a graphic instrument cluster, which is quite vivid and has a white back light. The floor has been carpeted with rich dark beige colored carpeting that adds to the elegance of this off roader and makes it look classy. The company has fitted this incredible off roader with a power packed 2.2-litre DICOR engine, which has been equipped with 4-cylinders and 16-valves . This engine has a dual overhead cam shaft and variable turbine technology (VTT) as well, which helps in better fuel efficiency. This power packed engine can displace 2179cc along with a formidable 138.1bhp at 4000rpm in combination with a pounding 320Nm of torque at 1750 – 2700rpm. This diesel engine has been mated with an efficient 5-speed manual transmission gear box. The company claims that this magnificent Tata Xenon XT EX 4X2 has the ability to generate a mileage in the range of 10.24 to 13.49 Kmpl, which is reasonably good and it has a fuel tank capacity of 65 litres as well. This front axle of this gigantic off roader has been fitted with a Independent Double Wishbone type of a mechanism, while the rear axle gets Parabolic Leaf Springs, which help in keeping this Tata Xenon XT EX 4X2 well balanced and stable on any terrain. The company has fitted the front wheels of this vehicle with a ventilated disc brake with twin pot caliper, whereas the rear wheels are equipped with auto adjusting type drum brakes for proficient braking. The list includes a powerful air conditioning unit with pollen filter, a tilt adjustable power steering, rear windows de-misting, all power windows with driver and co-passenger getting express down feature , key less entry and central locking, completely folding second row seats, adjustable lumbar support for all the seats. This off roader also has some storage spaces like cup holders on the central console, magazine pockets on the door trims, bottle holder on door trims, electronically adjustable external rear view mirrors, a remote operated fuel lid, front roof lamp, a 12V power point on the floor console, a tachometer and a tripmeter, analog clock, illuminated ignition key slot and power window winding buttons, puddle lamps for added comfort, sun shade band on the front windscreen, adjustable light intensity on the instrument panel, front height adjustable seat belts, sun visors, heated external rear view mirrors and many more such functions. The company has fitted this Tata Xenon XT EX 4X2 off roader with a number of safety and protective features. The list comprises of a door intrusion beam, a highly advanced engine immobilizer, a door open alarm, an LSD (limited slip differential) system , rear doors child locks, adjustable three point seat and lap belts for all the passengers along with seat belt unfasten warning, tubeless tyres, anti-submarine seats for enhanced comfort while driving, motorized head lamps adjustment, clear lens fog lamps on the front bumpers, door open warning lamp, fuel gauge with low fuel warning indicator, an internal anti-glare rear view mirror, a high mount stop lamp and many more such safety aspects as well. Pros: Very comfortable, loaded interiors, powerful engine. Cons: Engine noise can be reduced, mileage can be improved. Tata Xenon XT is available in 4 different colours - Arctic White, Arctic Silver, Mineral Red, Quartz Black - Xenon XT. Feels amazing and confident to pilot this mammoth!!! Powerful when turbo charged. Good for plain road. The 2.2-litre engine could be offered in the 400Nm tune! The Xenon gets a much needed update!